Pat Breen (centre), Irish Minister for Trade, Employment and Business, during his visit to Mexico City. 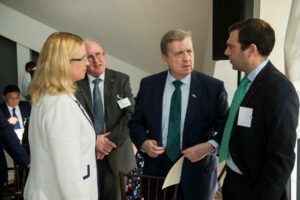 MEXICO CITY, Mexico, February 2018 – Alex Mahoney, country manager for Biz Latin Hub Mexico, attended an international trade event in Mexico City last week led by the Irish Minister for Trade, Employment and Business, Pat Breen. The event was organised by Enterprise Ireland, the Irish government organisation responsible for the development and growth of Irish enterprises in world markets. Over breakfast held at Restaurante del Lago, the Irish minister gave a speech promoting trade and economic ties between Mexico and Ireland before speaking to each of the guests table by table. As well as the Biz Latin Hub group, there was mixture of Irish, Mexican and other foreign companies attending the event. The period of networking at the end gave Biz Latin Hub the opportunity to increase their visibility in Mexico as well as promote their back-office services and connect with potential new clients and partners.